Wild Ones is a not-for-profit environmental education and advocacy organization promoting environmentally sound landscaping practices to preserve biodiversity through the preservation, restoration and establishment of native plant communities. We meet the 3rd Wednesday of the month at 7:00 pm at Fenner Nature Center, 2020 E. Mount Hope Ave., Lansing, MI 48910 unless otherwise noted. (No meeting in December.) The Center is located on the south east corner of Mount Hope Ave. and Aurelius Road, see map at right. All meetings and field trips are open to the public. We always welcome interested individuals to join us in learning more about Michigan's rich diversity of native plants and the wildlife that depend on them. Refreshments are usually served. In the summer months we visit outdoor locations instead of meeting indoors. See our upcoming events on the Wild Ones Red Cedar Chapter Events page! Valuable information about migrating birds is being collected at the Burke Lake Banding Station located in the Rose Lake State Wildlife Area near Bath, Michigan. Visitors are welcome to observe the process and see the birds up close on the days they are banding. Find visitor information and their calendar by following this link. by "poppet with a camera"
April is the time to put out a bee house to help our native bees. Many species of solitary bees nest in hollow plant stems or small holes in dead trees. If you provide a place for them to nest, they will reward you by pollinating your fruit trees and vegetable gardens. For easy directions click ﻿here﻿. Time to Pull Hairy Bittercress! 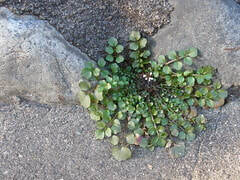 Look for small rosettes of Hairy Bittercress and pull them now! These plants flower and set seed very early in the spring. The seed pods are able to throw the seeds up to 3' away causing a large infestation before you know it. Bag and dispose of pulled plants in the trash as you would other invasive plants. For more information click here. Hummingbirds return to Michigan this time of year. Putting out feeders filled with homemade nectar (recipe) can help them survive until there are flowers to provide the real thing. 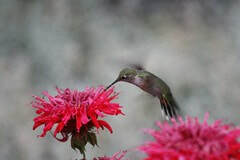 Plant a variety of native plants to supply them with flower nectar all season long. Click here for a list of plants they will love.